Depending on where you live in the world, you may need to use effective snake repellents to keep snakes away from your home. Many people have tried all different kinds of repellents to get rid of snakes with mixed results. Some methods to repel snakes contain chemicals that can be harmful to humans and the environment, while some snake control methods using natural ingredients don’t always give 100% protection against snakes. Of course, no one wants to be living with these crawling reptiles in their home. Even non-venomous snakes are never welcome in anyone’s home, not to mention finding a rattlesnake or viper in your garden. This article examines various tried and tested methods to keep snakes away from your backyard or home. We will also look at what science says as to the effectiveness of natural snake repellents and if using chemicals to repel snakes is ever justified. 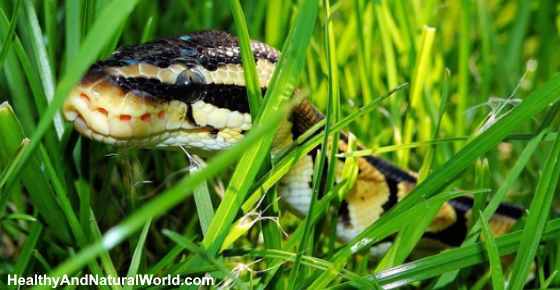 Are Natural Snake Repellents Effective? Keeping snakes away from your home is a challenge because it’s difficult to find effective snake repellents. Many people have tried to make their own anti-snake concoctions to repel these slithering creatures. After all, there are effective natural repellents for ants and natural products like diatomaceous earth which is great for eliminating cockroaches. But do snake repellents from natural ingredients actually work? The researchers also tried another natural snake repellent with ginger oil and water. This also resulted in the snakes slithering away when the repellent was sprayed on the brown tree snake. Professor Parkhurst says that the most effective way to keep snakes away from your home is to prevent them getting into the home in the first place. This means learning about snake behavior, eliminating things that attract snakes, and blocking point of access where the serpents can enter the home. Some websites offer natural snake repellents that they claim can help to reduce the number of snakes or eliminate them completely from your home or backyard. These use a combination of organic material to force crawling reptiles away from treated areas. However, there is no scientific evidence that these non-toxic snake repellents work against all species of snakes. Therefore, if you are interested in buying organic snake repellents, you should read online reviews of what users say about their effectiveness. Some websites suggest various plants to repel snakes from your garden, as it is believed that a certain odor of these plants make snakes go away. However there is no scientific evidence to prove their efficacy. Even when it comes to repelling snakes with chemicals, scientists and experts can’t agree on the effectiveness of these repellents for poisonous or non-venomous snakes. Some of the most popular ways to try and keep snakes away from homes are mothballs and products containing sulfur. Do mothballs act as a snake repellent? There are a number of other kinds of snake repellents that either have no scientific evidence for their effectiveness or they are ineffective at preventing snakes coming into your home. Even though granules containing sulfur and naphthalene have had some success, many people don’t want to use these treatments as snake repellents because they are toxic and can harm the environment. Snakes tend to enter homes and properties to look for food (i.e. mice or rats) or find shelter. Therefore effective methods to eliminate snakes from your home should prevent crawling reptile entering you home. Eliminate all food sources. If you have a problem of snakes getting into your living area, make sure and keep your home free from rodents. Also, don’t leave opened food containers out and don’t leave pet food out overnight. Seal any openings where snakes can come in. Make sure and close off or seal up any large cracks or openings where snakes or rodents can get into your home. So, check places where cables enter the home or where you have ventilation vents. Either seal up large holes or place wire mesh over the opening. Also, close off any spaces under doors or around windows where mice, rats, other creepy crawlies, or snakes can get in. Remove bushes or plants from the home foundation. Snakes love to hide in bushes and undergrowth. You can help prevent these reptiles getting into your property by not encouraging them to live or nest directly beside your house. To help protect your family and pets from snakes, you should also take measures to eradicate them from areas surrounding your home. The perfect habitat for snakes includes food, water and shelter. Therefore, the more you can disturb or eliminate their habitat from around your home, the less possibility there is that snakes will come into your home. Keep the lawn short. Don’t allow long grass to grow around or near your property. This is because snakes love to hide there and find shelter. Don’t allow vegetation or bushes to become overgrown. Keep landscaping simple. Try to reduce the number of spaces crevices in landscaping where snakes could shelter and hide. Remember that ponds can attract frogs which can be food sources for snakes. You could also try using pine cones, rock chips, or rose bush clippings around your garden to make these areas uncomfortable for snakes to slither across. However, despite doing all you can to keep snakes away from your home and prevent them inhabiting your backyard, you may still encounter a snake in the home. Virginia Polytechnic Institute and State University says that if the snake is non-venomous, you can try coaxing it into a large box placed on the side. Or you could scoop up the snake with a large-bladed shovel or broom handle. However, if you are uncertain as to the species of snake and don’t know if it is poisonous or not, you should not try to catch it. You can also use humane glue snake traps to capture snakes that are loose in your home. These work by sticking to the snake as it slithers over the glue trap and then rendering it immobile. The snake can then be carefully removed from the home and released from the trap by pouring some vegetable oil on it. If it’s not possible to trap snakes, you can usually get them away from your home by opening external doors and closing the internal doors in your house to allow the snake to escape. If you are unsure if the snake is venomous or not, or you can’t locate the snake in your home, then you should call a professional to get rid of it. Pest Manag Sci. 2002 Aug;58(8):775-83. VT-edu. Managing wildlife damage: snakes. ATSDR. Public health statement for naphthalene. UNL-edu. Test results of a new snake repellent. IAState-edu. Control snakes on a home property.